We have gone grill crazy since the weather turned nice. This week alone we grilled three of our meals and we have entertained friends two weekends in a row. Spring has definitely sprung!! This is one salad we make when we are tired of the usual mayonnaise based potato salad. This one we learned from Uncle Danny who prepares this dish almost every time we have a cook out at their house. It is quite simple to prepare. 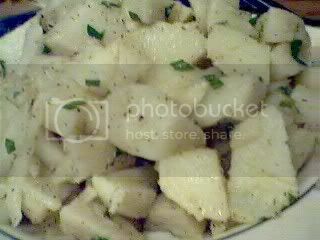 Red skinned potatoes are very attractive in this dish and that is what we normally use, leaving the skin on; but this time, I only had white potatoes. Boil the potatoes until they are cooked through. Cool them a bit before slicing them up (since I used white potatoes, I peeled them first). Chop some red onions (about 1/2 cup) and flat leaf (Italian) parsley (about 3 tablespooons or more if you prefer). Add these to the potatoes along with a drizzle of olive oil, and season with salt and fresh cracked black pepppers. I just eyeball the olive oil and don’t measure. The trick is to just give enough to coat the potatoes but not saturate them. This can be served hot or room temperature. I wouldn’t recommend chilling it. The good thing about it is, since it’s not mayonnaise based you can leave it out until it’s time to eat.